I have an irrational fear of gnomes. It creeps me out the way these little creatures sneak around causing mischief. The way they pretend to act like real people is unnatural. Their little voices send chills down my spine. Oddly enough, leprechauns and tommyknockers don't bother me. I can't completely put my finger on what it is, but something about gnomes are completely frightening. Quite often when I see several gnomes together, I scream like a little girl. I can't help it, they freak me out. My wife has a similar issue with spiders. 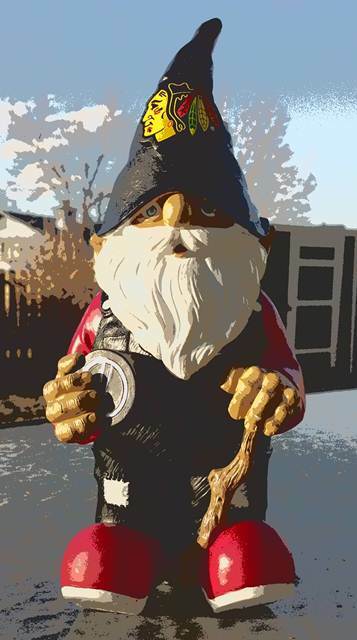 The thing that freaks me out the most about gnomes is the unnecessary silent g. I want to pronounce it "Ga-nome", and I can see them smirk when I do that. Even when I don't actually see a gnome, the silent g makes my mind flash to those little smirks. Oddly enough, the g's at the beginning of gnats and gnus don't affect me nearly as strongly as the gnome g (probably because gnats and gnus don't flash me that evil smirk when I try to pronounce the hard g sound). As I mentioned last week (see 1D. Munich Helles), I was planning on brewing Snowball's Chance (in) Helles this weekend. I followed through with the plan Sunday. Snowball's Chance (in) Helles is a Munich Helles, a German light lager which I am brewing to take care of BJCP Category 1, Light Lagers (see SheppyBrew Styles). Of the Light Lager styles, the Munich Helles is the most flavorful with a significant, slightly sweet, somewhat rich malt profile. Brew day started early. I was wondering as I dug my propane and burner out of the shed how many home-brewers have to use a flashlight as part of their brewing equipment. It is an important part of mine, as the sun is usually not up when I start brewing. The following "Dear John" letter is meant to be ridiculously sarcastic. Apparently, I failed miserably in conveying the sarcastic tone. Today, I got an email from my Contact Me form asking how much of a "boatload" of money I was able to get. It sounds like the individual who emailed me got a similar email from John or someone else and was considering my "response" as validation that he might himself become wealthy from this "opportunity". As I mentioned in Neil Zhang, the emails I got and others like them are [obvious] scams. I do apologize for my apparent failure. If you come across this blog post because you are considering contacting John or Neil or others like them DON'T. or just google Domain Name Scams. I mentioned not-to-long-ago that my 2013 brewing goal is to expand my resume of beer styles. I want to have at least one beer brewed of each of the 23 BJCP style categories. After my 7C Düsseldorf Altbier, I now have 10 more categories to brew. Next up, is Category 1 — Light Lager. Specifically, I have decided to brew 1D. Munich Helles. A Helles is a light-colored German lager. It has a clean, slightly sweet, malty flavor with low to moderately-low spicy noble hop flavor and aroma. It is low in hop bitterness. It is low in alcohol and easy drinking, making it a great session beer. It is also one of those beers that will ease non-craft-beer-drinkers into more flavorful craft beers (aka gateway beer). Today, bottled up some beer. 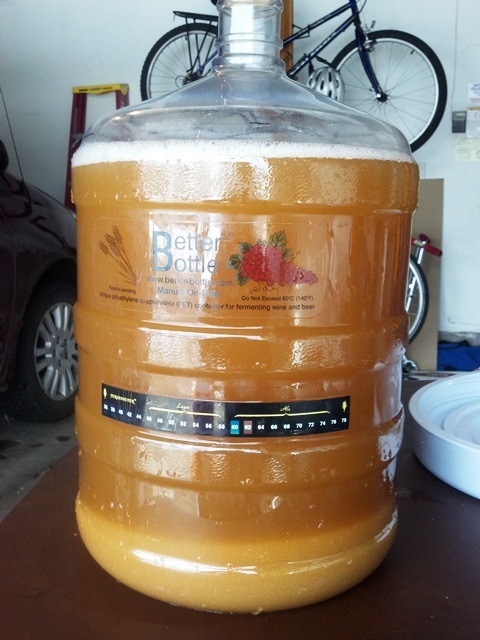 Remember when I brewed my Whacko Wife Pumpkin Witbier, I had about one extra gallon of wort that I let ferment in a separate fermentor? If you don't remember, you can refresh your memory at Whacko Wife Pumpkin Brew Day. I mentioned that my plan for that extra gallon was to blend it with my Rationalité Poison d'Ereeeek, which is my sour Flanders Red style beer. It has been awhile, but finally decided to go ahead and blend the two beers and bottle up the result. My bottling experience was a bit "old-school" for me. For quite awhile, when I've bottled beers, I have used my keg and Beer Gun to fill the bottles. Today, I decided to use my Mr. Beer "bottling bucket" and bottle-filling wand. I don't even remember the last time I bottled using this technique before today. First, I transferred the gallon of Witbier from the fermentor to the bottling container. I added enough priming sugar to handle 2 gallons of beer. I skipped last month's "The Session" (aka Beer Blogging Friday). I just had a hard time focusing on the topic. Nothing against the topic. I actually do think about beer hype quite a bit. I just didn't feel I had my blogging head around it last month. When I saw the announcement for this month's topic, though, I had JUST been talking to someone about it. Yes, surprising as it sounds, sometimes I talk to people about beer. Quite often, really. 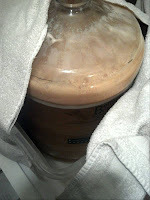 This month, John at Home Brew Manual is hosting the topic Brewers And Drinkers. He brings up that it surprises him how many beer bloggers out there don't brew. For him (as for me), the overall enjoyment of beer has changed since becoming a brewer. I have shared several times with lots of people (I've probably even mentioned it on this blog) that I never really appreciated (or really liked all that much) American IPAs until I had been brewing for awhile. I've shared similar sentiments about Belgium beers. I sort of doubt I would necessarily be into Sour Beers without being a brewer. It is clear that I have a much deeper knowledge and appreciation for beer now that I brew my own beer. Yes, 2012 is over. SheppyBrew Brewery was busy this year. For quite awhile I was thinking my 4th quarter was just crazy, but as I told you in Correction: 2012 Q3 SheppyBrew Stats, I accidentally ended the 3rd quarter early on my brew stats spreadsheet. So, I was thinking that Q3 was low and Q4 was high. Since then, I have fixed my spreadsheet. As I mentioned, New Year's Day 2013 was a brew day for me. I brewed my Sasquatch Hunter Düsseldorf Altbier, which is SheppyBrew's first Altbier. You can see the recipe by following the hyperlink. I got started before 6 AM and as it was dark and cold, I brewed in the garage. The mash went pretty smoothly. I did over-shoot my strike water a bit, and had to cool down the mash to 152, but I got there quickly and the temperature remained constant for an hour and 20 minute mash. While waiting for the enzymes to do their magic, I played Wii Mario Kart, which is a pretty amusing game. So, December continued this Blog's infamous streak of increasing monthly record breaking page-views. I needed all 31 days to beat November's total. That last week between Christmas and New Years Eve was pretty slow, but the blog viewers got it done for me. And as I know you are incredibly curious, following is a list of the most viewed blog posts from December. This month, unlike November, I got a few posts that were actually written during the month.